At long last! The first Avengers' story line has ended! After the ending of Siege, and "Dark Reign" in general, the "Heroic Age" popped-up on titles everywhere in the Marvel Universe. The Age's main books have been the various Avenger titles, including today's comic of the day title The Avengers. Left with wonder at the new direction of the "Heroic Age", I decided to pick up the various Avengers' titles and give their first arcs a shot. The Avengers, the title with the heavy weight characters such as Iron Man, Thor and Captain America, just wrapped it's first story which involved time travel, Ultron and future children Avengers. 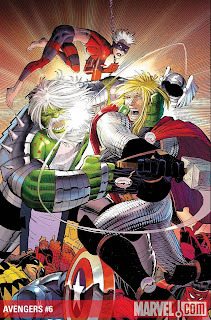 I wouldn't necessarily say I did not like the adventure Brian Michael Bendis started out with; however, I just never cared too much...largely due to the art of John Romita Jr. I'm done with J.R. Jr. His art looks more and more remedial every time I see it. I understand he works fast and he has a recognizable name, but unfortunately for Marvel I think John Romita Jr.'s name may be hurting this series in the future. 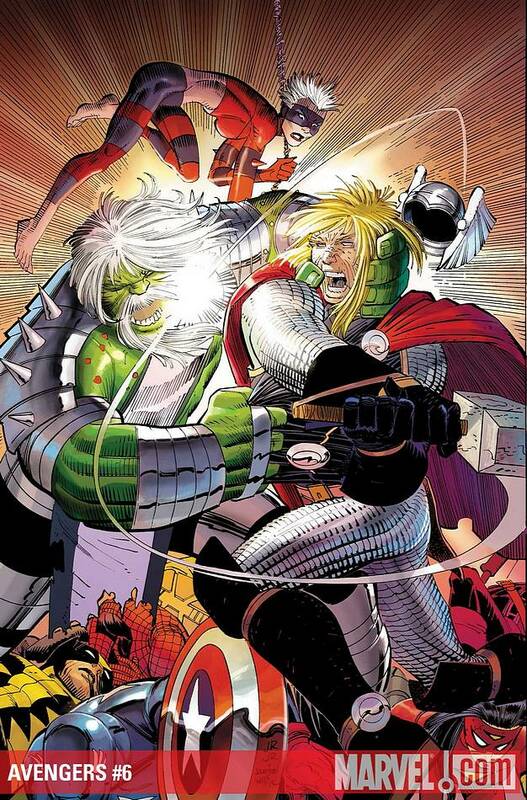 I have yet to hear one person at my comic shop say they enjoyed the art in the Avengers. I echo their thoughts, and here by declare that The Avengers #6 will be my last issue in the series until a new artist steps in. Labels: 365 days of comics, Avengers, Brian Bendis, comic books, comic of the day, heroic age, John Romita Jr.